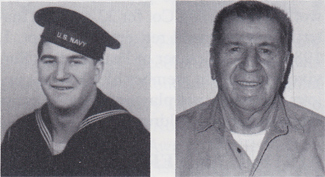 George T. Milekovich, Sr., Shipfitter 2/c, born April 8, 1923, Campbell, OH. He entered the USN May 26, 1943; was stationed for boot camp at Great Lakes NTC before reporting aboard the USS West Virginia in August 1943. He served with pride as a ship-fitter 2/c in the R Div. He vividly remembers the Japanese kamikaze that struck the Wee Vee on April 1, 1945. He also cherishes the memories of the fun and ceremonies when crossing the Equator. He was discharged Feb. 6, 1946. Milekovich settled in Lansing, MI, where he married his wife, Lureta (Rasmussen), on Feb. 14, 1947. He and Lureta have four sons: James, Anton, Edmund and George Jr.; and nine grandchildren. He retired on June 1, 1985, from Michigan State University, where he served as an operating engineer for 26 years at the University Power Plant, East Lansing, MI.